As Joseph Goebbels observed, "The most brilliant propagandist technique will yield no success unless one fundamental principle is borne in mind constantly - it must confine itself to a few points and repeat them over and over." The propagandist relies on repetition--not evidence. 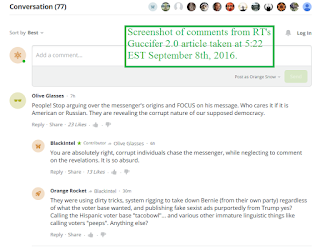 And repetition appears to be doing the trick as far as public perception of Guccifer 2.0 is concerned. Once upon a time (as recently as June of this year), there was no Guccifer 2.0. Then Guccifer 2.0 appeared out of nowhere with a blog and some leaked documents. Immediately, CrowdStrike (which is a private cybersecurity firm, not a governmental agency) warned us that Guccifer 2.0 might be a Russian cyberspy. 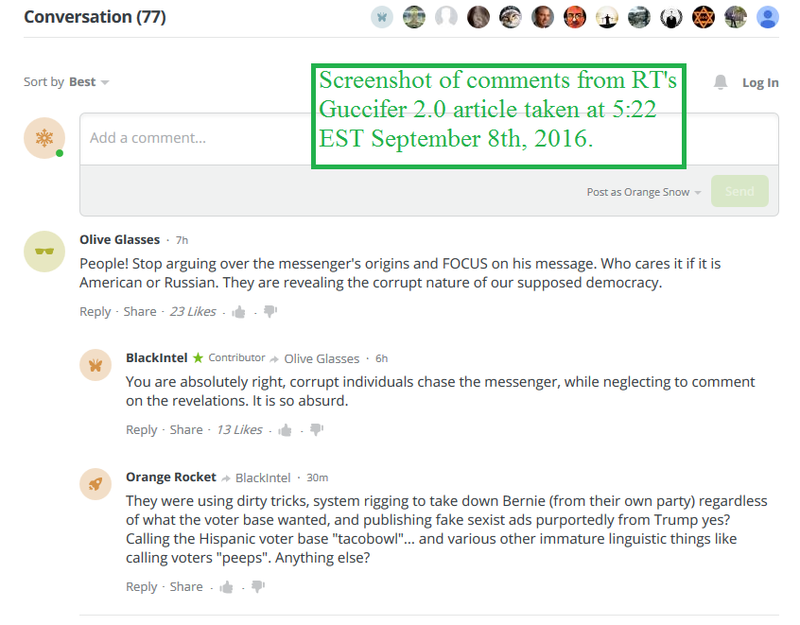 Note that in this first, tentative effort to overwrite reality with propaganda, CrowdStrike relied on a whether-or-not construction to articulate the accusation without quite asserting it: "Whether or not [the Guccifer 2.0 blog] is part of a Russian Intelligence disinformation campaign, we are exploring the documents’ authenticity and origin." CrowdStrike's leaders (including former FBI Assistant Director Shawn Henry, who revolving doored his way into the presidency of a cybersecurity firm shortly after retiring from his government post in 2012) never got around to commenting on the authenticity of the leaked documents, but they lost no time in assembling a squadron of cybersecurity experts at similar firms who were willing to repeat the claims about Russian agency--based on the analysis of data provided to those firms by CrowdStrike. Meanwhile, Guccifer 2.0 claimed to be a lone Romanian hacker who had named himself after the original Guccifer (also Romanian) as a point of national pride. We shouldn't trust Guccifer 2.0. He's a hacker who has all sorts of motives for concealing his identity. But neither should we trust CrowdStrike. They were brought in to handle the DNC data breach after it was detected, which suggests that their role in this affair has more to do with managing public relations than keeping data secure. So it wouldn't matter at all to me if people responded skeptically to both positions by saying, "Who knows whether Guccifer 2.0 is Russian or Romanian?" But that's not what people are saying because they haven't heard Guccifer 2.0's side of the story--even though they've heard CrowdStrike's assertions about Russian operatives from the New York Times, the Wall Street Journal, and every major television network in the country. Even though the comment plainly comes from a reasonable perspective, the writer appears to be completely unaware that Romania is even in contention as Guccifer 2.0's nation of origin. No one should be faulted for distrusting Guccifer 2.0. (I distrust him too!) But those who are interested in the story of whether he really is Russian should at least be familiar with what the hacker himself has claimed on the subject. If the media's role is to inform us, then readers who are engaged enough by the Guccifer 2.0 story to comment on it should be able to demonstrate an awareness of the most basic claims being made by those involved. But our media's job is not to inform us. Its job is to manufacture consent among the common folks for the agenda of the elites. And since the war profiteers backing Hillary Clinton's candidacy are eager to take us to war with Russia as soon as she is elected, the media's primary job in connection with Guccifer 2.0 is to use the hacker as evidence that America is already under attack. The more frequently our newspapers and television pundits repeat that our electoral process is being manipulated by Vladimir Putin, the easier it will be to manufacture public consent for escalating the current proxy war in Syria into something bigger and more profitable (much as the the proxy war in Spain in the 1930s escalated into World War 2). In January of 2017, after we're well and truly on the warpath against Russia, what will happen if a Romanian hacker surrenders himself to authorities to prove that he really was the lone individual responsible for the DNC leaks? We'll go to war anyway. That much is obvious. But it's equally obvious that millions of Americans will say, "If he was just some random Romanian all along, why didn't anybody tell us so?" He did tell us so. But realities that aren't discussed always seem less convincing than fictions that are.